GREENWICH — For Randy Feda, becoming the general superintendent of construction for the New Lebanon Elementary School’s new state-of-the-art building was a lot like coming home. First, his commute was reduced by an hour: from going to New York City to driving just 10 minutes from his home from Old Greenwich. And since he knows many people in town, his new job also gives him a chance to catch up and work with friends and acquaintances. But most of all, Feda came back to the elementary school he attended in the early 1970s. Now, he’s building a new school for children who learn in the same exact classrooms he learned in 40 years ago. As the project’s superintendent, he sees his job as a way of giving back to the public school system that educated him — from New Lebanon through Greenwich High School. Before joining Gilbane Building Co. for this project, Feda did construction management in New York City for 12 years. Although he has worked on some projects in Greenwich, including mixed-use buildings and homes, Feda had never tackled anything like a school. 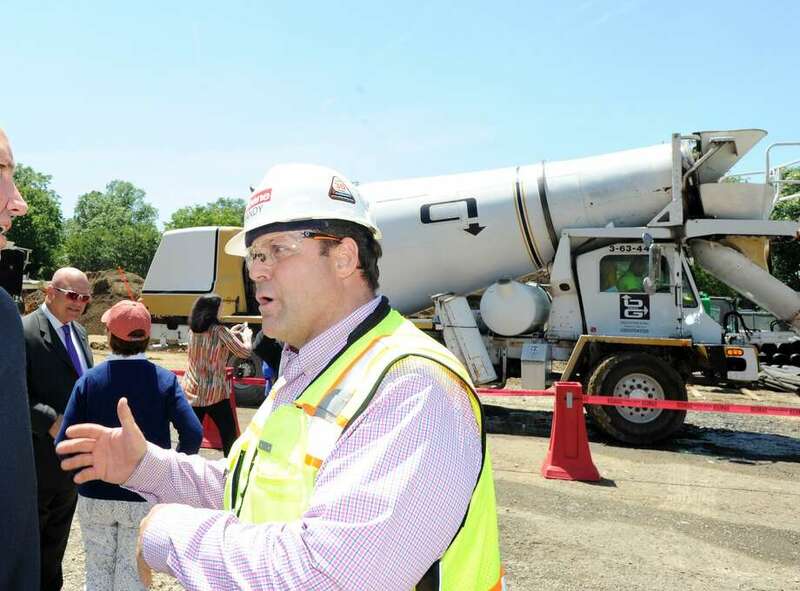 So when Gilbane told him that he’s be working on a project in Fairfield County, a new school in Greenwich called New Lebanon, he was surprised. While the school itself has stayed the same since his time there, the needs of the community and the building standards have changed. The outdated New Lebanon school is so overcrowded the kindergartners have moved off-site and music lessons are held in the foyer. Feda’s job involves overseeing the project to make sure it is built to plans and specifications, whether that’s examining the parts being installed or performing checks for quality control. He spends 90 percent of the day in the field, but he also has to do computer work and daily reports. Feda’s also the go-to if any problems arise, making sure to take resolve them efficiently. He hasn’t just overseen the building, however. “He is the face of the construction,” New Lebanon Assistant Principal Klara Monaco said. Twice, Feda has delivered presentations to the students. The first time, Feda addressed topics guaranteed to interest kids: big trucks and explosions. The kids asked many important questions, Monaco said, because at the time they were hearing the blasts (which Feda timed around testing) and seeing a variety of trucks clearing the land. Monaco said Feda loved chatting with the kids, and he kept everybody entertained. When he was a child, Feda said he loved construction, and he knows kids today do, too. For him, it’s all about the children: giving them a school with the facilities they want and putting smiles on their faces as they watch the construction of their new building. During Safety Week, Feda addressed the students again. Standing next to a police officer, both in full uniform, Feda told the kids what workers do to be safe at a construction site and taught them rules about trespassing and private property. It’s not just during Safety Week. Riccio said Feda is always looking out for the safety of the New Lebanon students and staff. For Riccio, considering the ease with which students approach Feda and the emphasis he places on safety, the kids relate to Feda for a simple reason: because he is a father. And while his building won’t directly affect his teenage children, Feda said he is building it for the children of the Byram community.